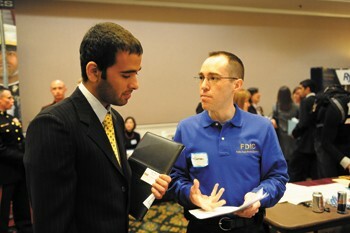 Senior Prateek Yadav speaks to FDIC examiner Stephen L. Whitworth at the career fair in Hughes-Trigg Thursday afternoon. Students flocked to the Hughes-Trigg Student Center on Thursday, clad in their best business clothes and carrying freshly updated résumés in the hopes of receiving a job in the midst of our nation’s struggling economy. More than 80 businesses seeking potential interns and full-time employees met with students of all majors at The Hegi Family Career Development Center’s biannual Career Fair. 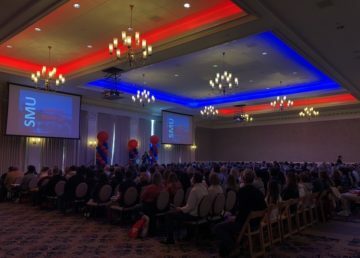 With roughly 6,000 students attending this year, the event is an effective way for students to learn more about their potential careers and also find internships or full-time jobs for this summer or next year. Each business fills a table with the company’s information and “giveaways” in an effort to attract students. At least two members of the company flank each side of the table ready to answer students’ questions. A student should state “what you need to know about me to hire me,” Ford said. This trick can be used anytime, not just at the Career Fair, Ford said. 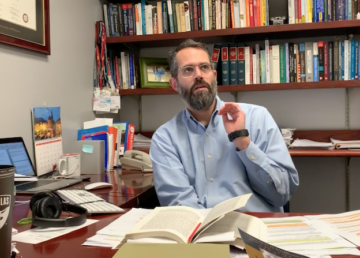 It is important to present “strengths of yours that are connected to whom you’re in front of,” he said. Recruiting Coordinator for Mohr Partners Erin Edelson also noticed less recruiting. One of the many SMU students to visit the fair was Blair Flowers, who found the experience of meeting potential employers to be very helpful.